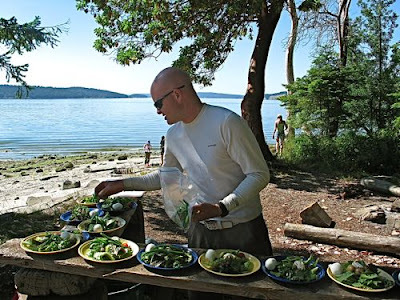 Enjoying a gourmet kayaking adventure in BC's Gulf Islands. Sue Frause photo. British Columbia travelers are trading relaxation for transformation. That's according to the British Columbia Automobile Association, who say that adventure and educational travel are the trends for 2008. Adventure Travel: This includes outdoor activities, volunteering and cultural immersion. It can range from traversing the Arabian Peninsula on camelback to such soft adventures as watching giant sea turtles lay their eggs on a Costa Rica Beach. More women, honeymooners, families and the over-50 set are booking adventure holidays. Educational Travel: Learning over lounging. It can be a skill, sport or lifelong interest. Activities range from themed tours of the great opera houses of Europe to studying the Amazon rain forest. Particularly popular with university-educated professionals who want to enrich their lives in areas other than which they are working. Health and Spa Travel: These range from rustic retreats to luxury destinations resorts. Health-centric vacations are popular getaways for people seeking balance in their lives. Vacationers are selecting resorts that specialize in their preferred sporting pursuits such as golf, tennis, yoga or Pilates. Culinary Travel: Combining food, wine and travel is the ideal sensory experience for many. Tuscany has long been a destination for foodies. Other popular getaways including dining at unique restaurants, touring farmers' markets, wineries, gourmet food shopping and food and wine festivals. Another trend is group travel. This includes multi-generational family getaways for reunions, weddings, milestone birthdays or holidays. Individual travelers are also connecting with other like-minded travelers to vacation as a group.